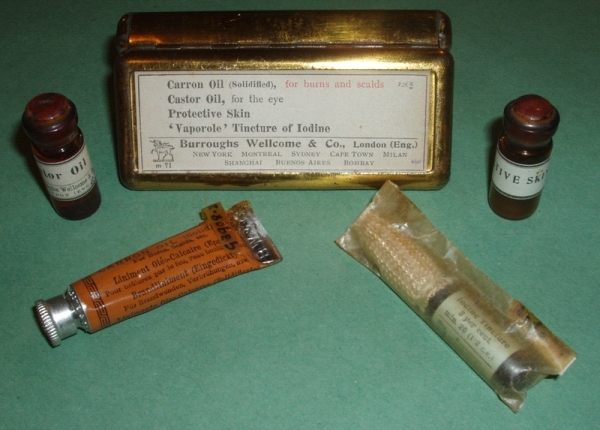 Today we look at a tin containing its original contents – medicaments. This little tin was produced by Burroughs Wellcome and Co of London. The Wellcome name is still well known in the medical field. As we can see, the tin contains Castor Oil, for the eyes. Protective Skin, Tincture of Iodine and Carron Oil for burns and scalds. This collection was the property of Miss Rose Crouch. Rose was born Rose Brown Hiscock in Market Lavington. She first saw the light of day in 1904. Her parents were James and Amelia and they lived on High Street in Market Lavington. Rose married Henry G W Crouch in 1934. Rose was widowed in 1957 but she remained a Market Lavington person. She died in 1987. Both Rose and her husband are buried in the Market Lavington churchyard. It is believed that young Rose volunteered for the Voluntary Aid Detachment towards the end of the first world war – she’d only have been 13 or 14.. The Voluntary Aid Detachment (VAD) was a voluntary organisation providing field nursing services, mainly in hospitals, in the United Kingdom and various other countries in the British Empire. The organisation’s most important periods of operation were during World War I and World War II. This entry was posted on May 19, 2012 at 5:30 am and is filed under Museum. You can follow any responses to this entry through the RSS 2.0 feed. You can leave a response, or trackback from your own site. Rose Crouch lived next door to my gran, Emily Hobbs – later Pomeroy who lived in Fern Cottage. She was my gran’s landlord. Her husband was a retired policeman. Around the back they used to have lovely cultivated blackberries growing against the house wall – they tasted good! Thanks, Jim. I think the comments people add make this blog much more useful.